Table Model Analytical Sieve Shaker are used in research & development , Quality Control Of Raw Material , As well as in Production Monitoring. The Heavy Cast Iron Unit. The Motor Actuates a eccentric weight , This Producing uniform motion an sieves table ; Which is equality Balanced mounted on helical springs . 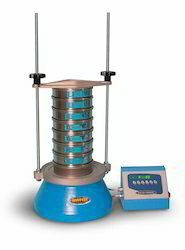 The vibration on sieve Table can Be control by speed regulator & Imported Mechanical Timer to set required time for sieving analysis, Variable vibrating amplitude as required 10 to 60 minute. Mechanical timer 10 to 60 minutes for auto - cut off of set time for sieve analysis. L/R Required for Sieve Analysis.